Mathbooking is a fun activity that combines the analytical skills of solving math problems with the creative fun of scrapbooking. Children can practice their math skills according to the standards in the Common Core State Standards Initiative while answering a series of math questions of varying difficulties using writing, drawing, cutting and pasting, and storytelling. 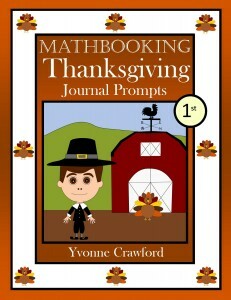 The Mathbooking: Thanksgiving Journal Prompts booklet includes 30 colorful worksheets with a series of math journal prompts featuring a Thanksgiving theme – pilgrims, turkeys, farms, the harvest of fruits and vegetables, and the many things that we can be thankful for during the fall season. The math problems are designed to test students’ problem solving skills according to the various Common Core State Standards for Mathematics domains that contain the individual Common Core standards. Math journal prompt packets are available for 1st, 2nd, 3rd, 4th and 5th grade classes. All artwork in these packets is original and was created by us. Please let us know if you have any feedback on our math journal prompts or for any of our educational products! We’re always looking for ways to improve upon the curriculum that we offer to satisfy a variety of teaching needs. Common Core domains: Operations and Algebraic Thinking, Number and Operations in Base Ten, Measurement and Data, Geometry. Common Core domains: Operations and Algebraic Thinking, Number and Operations in Base Ten, Number and Operations – Fractions, Measurement and Data, Geometry. 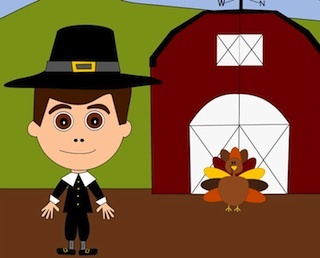 We hope that you, your family and your students have a wonderful Thanksgiving holiday! Teach your child math by combining the creativity of scrapbooking with the analytic problem solving of mathematics.